As Spring slides gently into Summer. 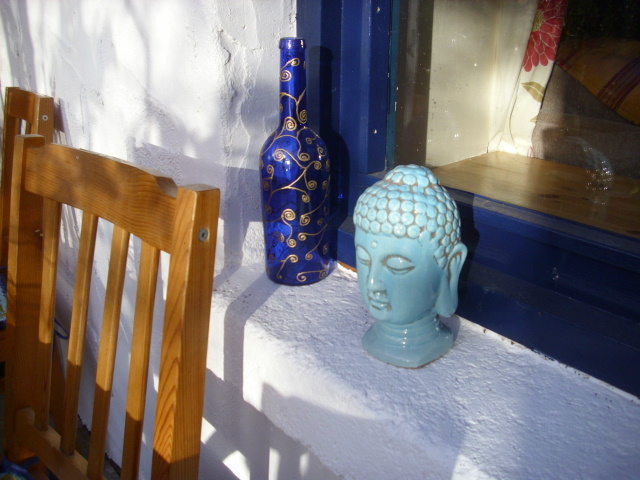 It was a beautiful day today, warm and sunny, an ideal day for working outdoors. I’m not a very early riser but I was up at 7.30 today, woken by the feeling that is was going to be one of those perfect days. 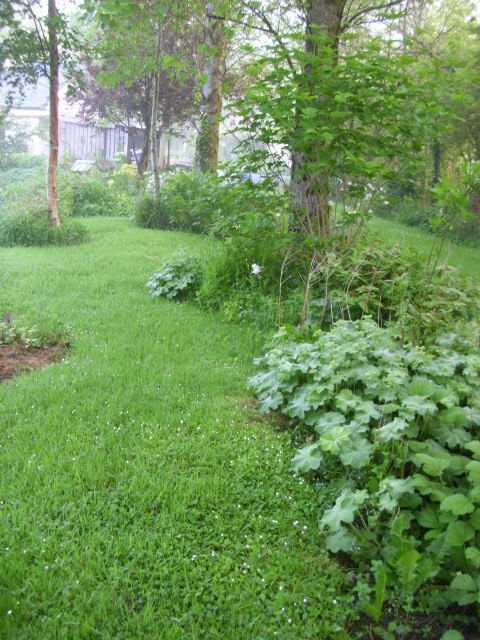 The garden is green and fresh and feels so vibrant right now. One can almost see things growing. 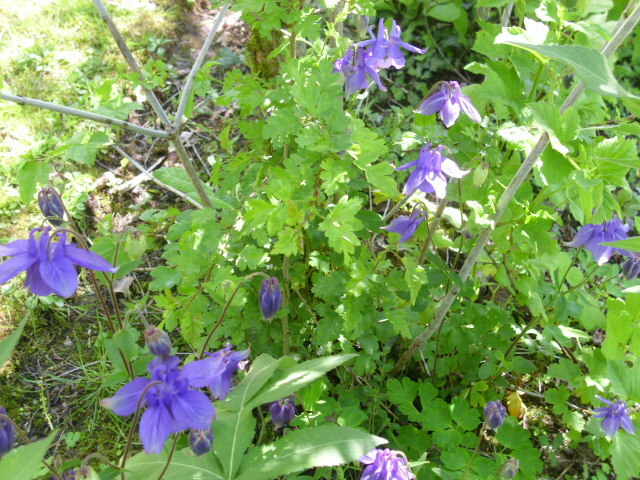 The old cottage garden favourite Granny’s Bonnet or Columbine has burst into bloom. 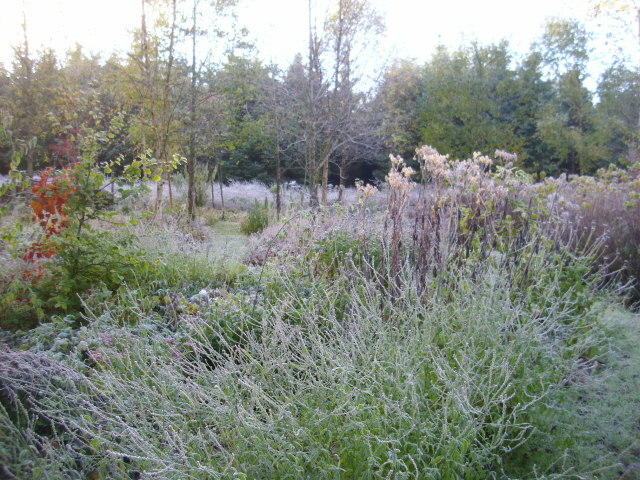 It all over the garden in shades of blues, pinks and creams. Luckily I like it very much. The Tulips are still giving some colour too. These are late partly because of the cold Spring but also because they were planted late, a bargain buy in the January sales. Most of the day was spent working on this bed. 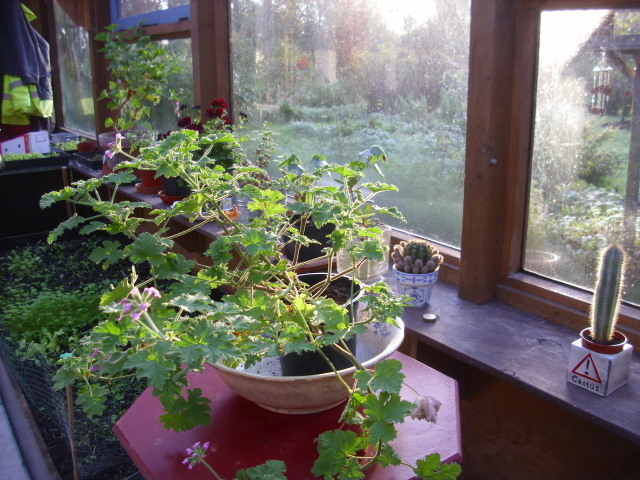 I planted about 30 plants in here, all grown from cuttings from my old garden. The exception being the Maple planted at the top, the dogs are admiring it here, this was a birthday present from my Mother. This is the same bed about a month ago. A good transformation I think. 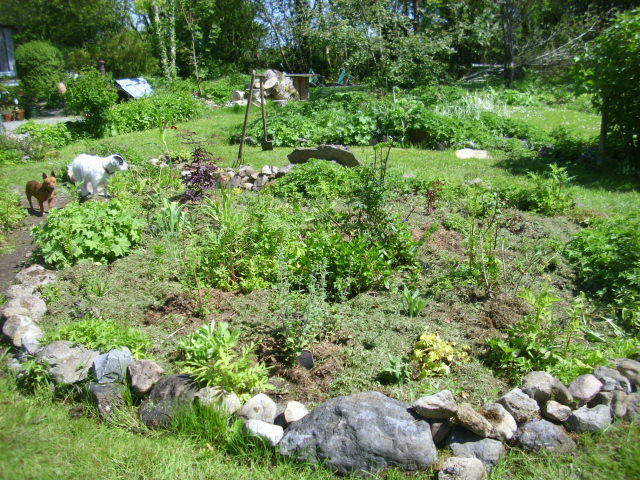 After everything was planted, I mulched the bed with wilted grass clippings. These will keep the weeds down, hold the moisture and feed the plants as it rots down. 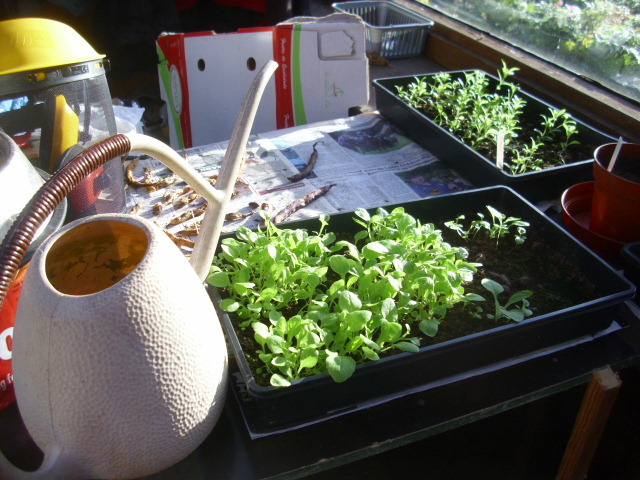 I watered everything when the Sun went down, first with water and then with a manure tea. That will feed everything and also get the soil microbes active. As I was planting I hit rock a few times. Further investigation revealed some lovely flat stones. 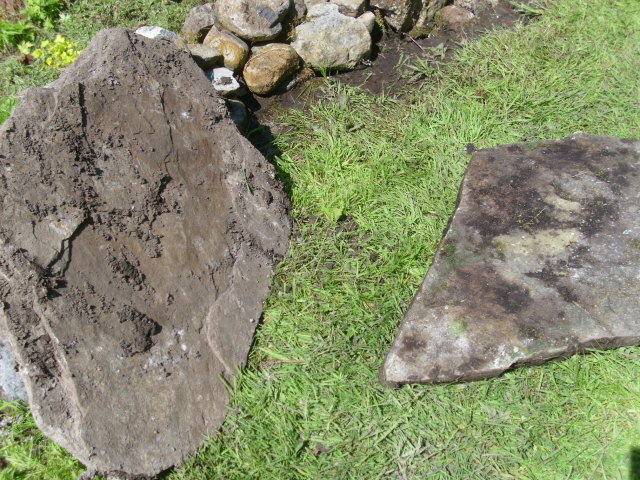 These will be used in another part of the garden as stepping stones. Sitting on the verandah in the cool of the evening and I’m still enchanted by the day and the lovely way the long Spring is sliding nicely into Summer. Hopefully there will be many more days like this one. 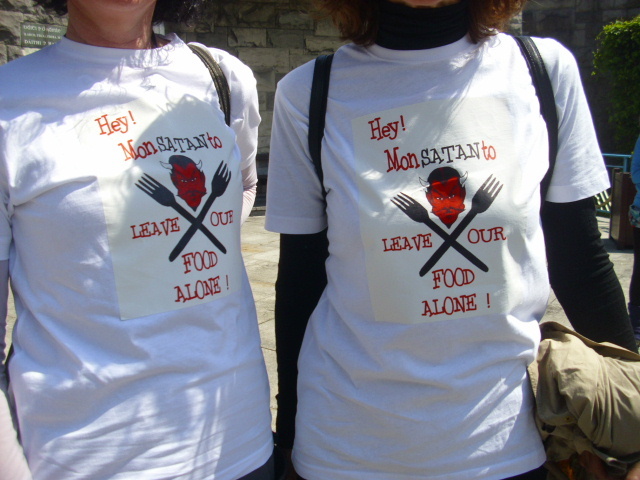 Yesterday was March Against Monsanto Day all over the world. Andy, myself and our friend Charlie went up to Dublin on the train. 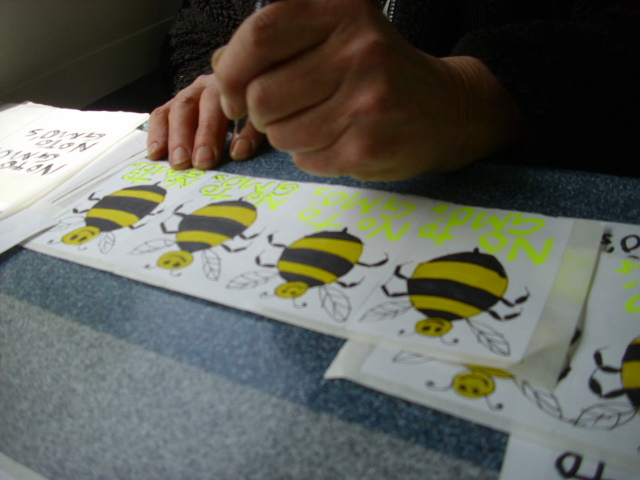 On the way we made stickers to distribute on the march. 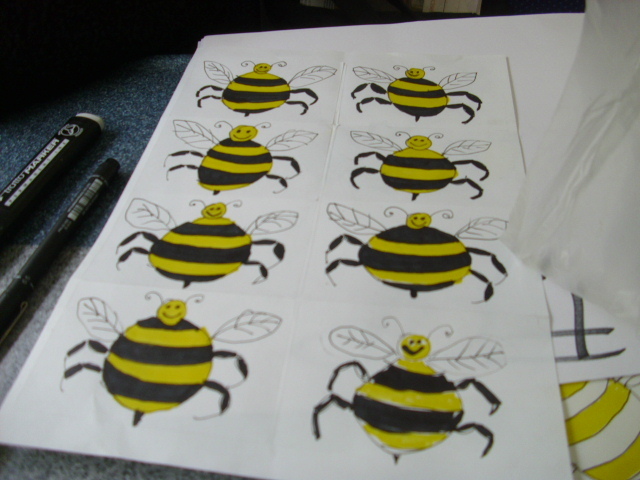 Charlie drew the cartoon bees and Andy and I coloured them in. 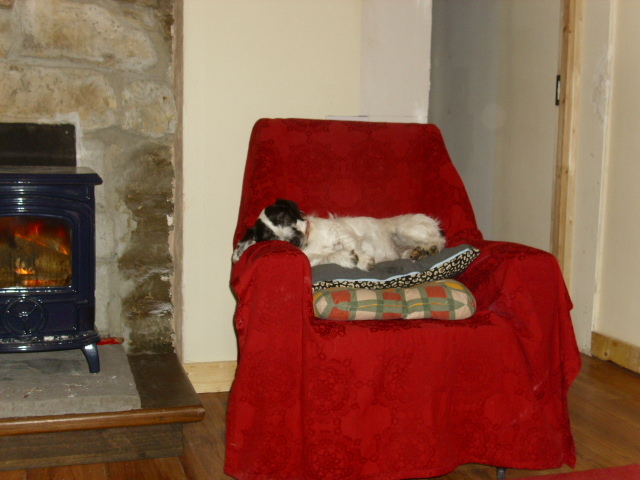 It made the journey very short to be occupied on the way. On reaching Dublin we went into the centre on the Luas and then on to Govinda’s Vegetarian Restaurant. A good meal to sustain us on the march. Forgot to take a pic but the meal was utterly delicious. 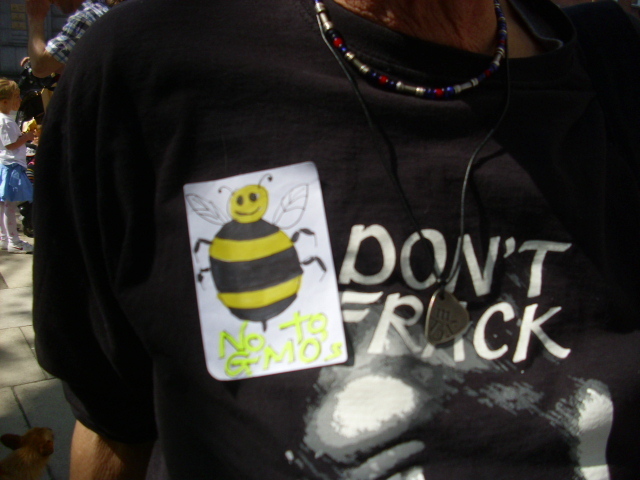 As we made our way to the Garden of Remembrance, where the march was starting, we placed a few stickers in prominent spots. This one on The Spire, a stainless steel momument on O’Connell street. On reaching the Garden of Remembrance I was a bit shocked to find very few people there. 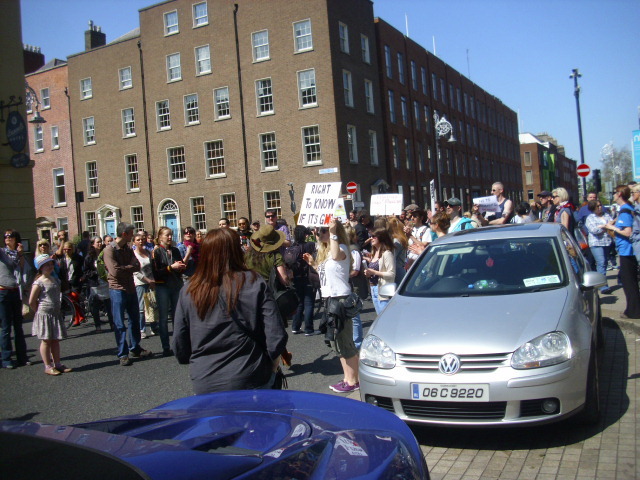 However by 2.30 a crowd of about 300 had gathered. A bit better but in my view a very disappointing turnout. 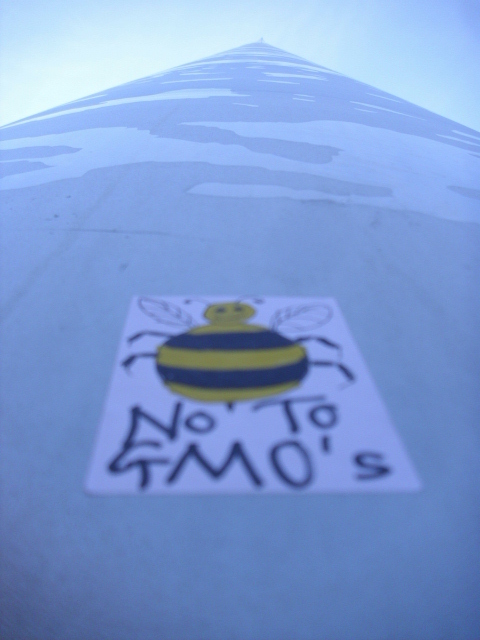 GM food is such a serious issue I just can’t understand why people are so apathetic. If one did a survey most people would say they didn’t want GM foods. 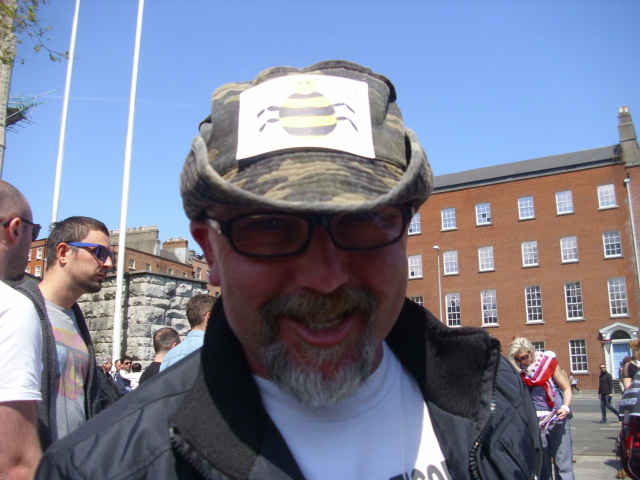 What they don’t know is that even in Ireland GM foods are already here. Animal feeds all contain genetically modified maize, unless they are organic, so our food chain here is already contaminated. I also learned yesterday that GM potatoes are being trialed in Ireland this year. They were planted last week in Co. Carlow. 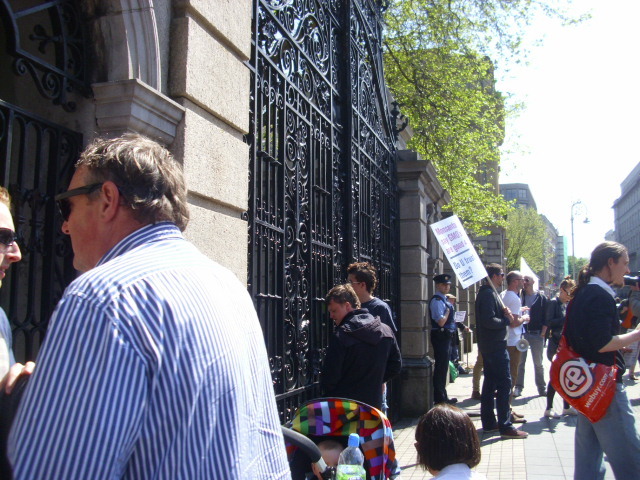 The march first stopped at the Dail and then on to the Department of Agriculture. 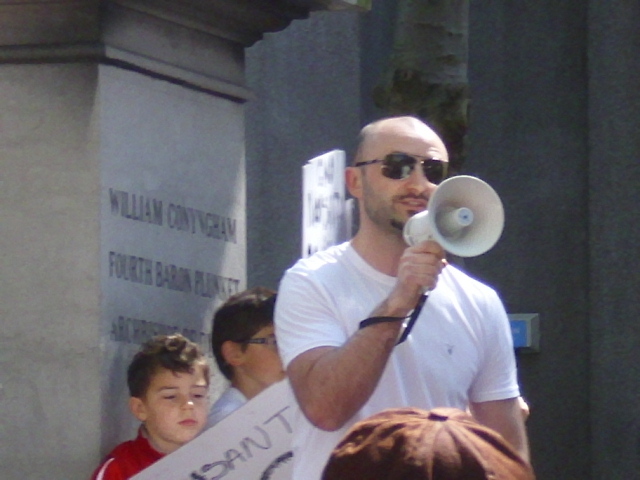 Tony O’Brien who organised the march spoke very passionately and said that this was just the beginning of the campaign against Monsanto worldwide. I suppose the biggest way to hit them is financially by not buying their products, but without clear labelling this is hard to do unless one can buy organic produce. Most people are just trying to survive in this recession so it is hard to opt for higher priced organic foods. Even finding them can be hard unless one is near a good Farmers Market. With the possibility of fracking in Ireland also on the agenda it seems a strong possibility that our clean green image is to be sacrificed on the altar of corporate greed and exploitation. How sad is that??!! However, as the saying goes, life goes on. One has to balance being concerned about these issues with trying to do your bit and living a happy, peaceful life. 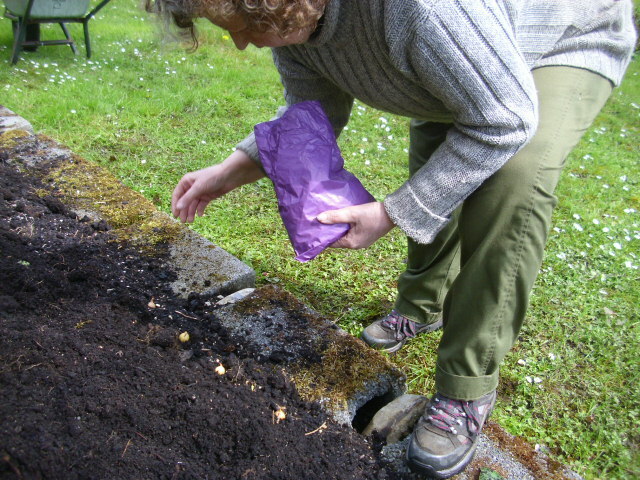 We will grow what we can, from organic and home saved seeds and try and buy what we can organic. 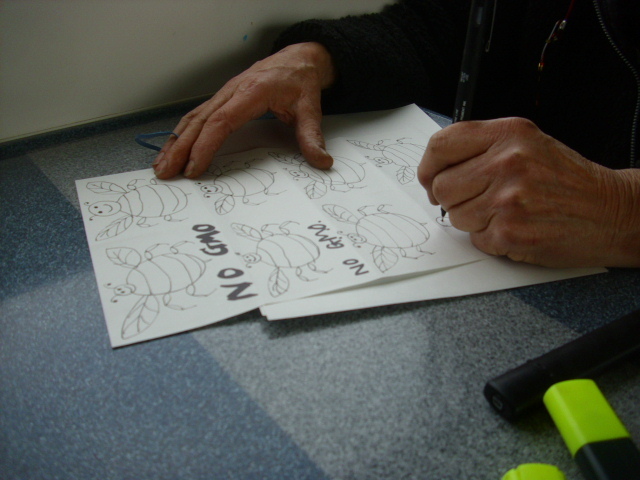 Trying to live as sustainably as we can is about all an individual can do but together we could do so much…. 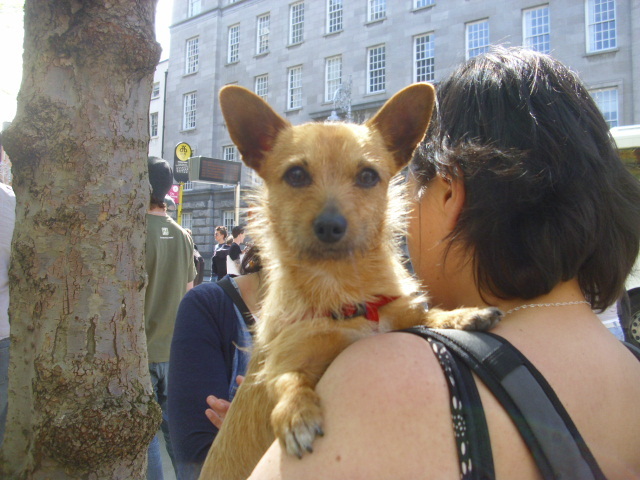 To finish here is the cutest doggie of the day. 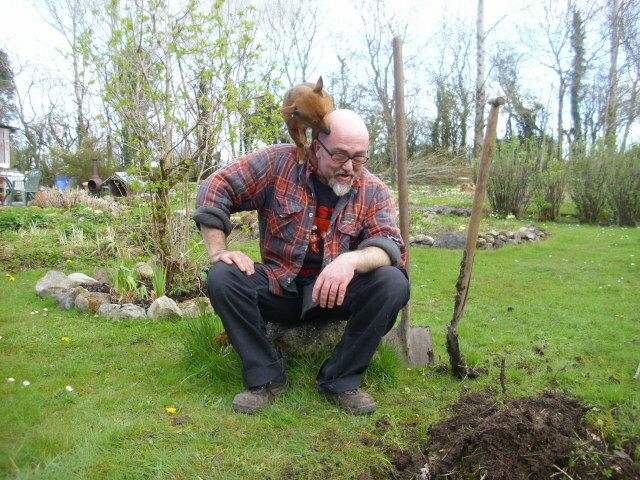 A Fox, Clouds and garden progress. 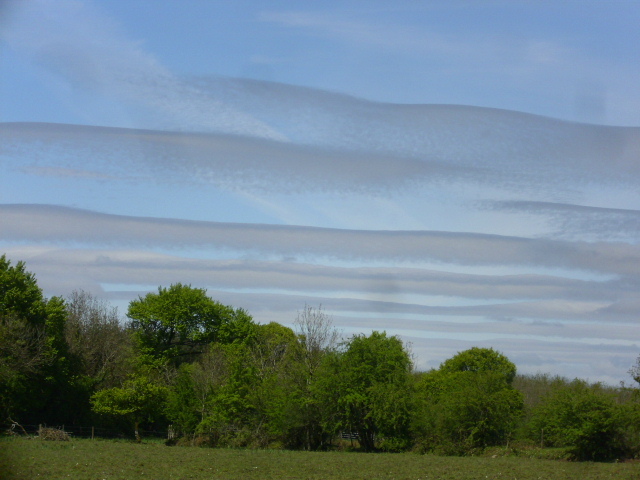 Some very strange clouds 2 days ago…unlike any I can ever recall seeing. Hopefully they are the good weather clouds. Yesterday evening Andy took the dogs for their daily walk in the woods behind our house. Half an hour later he was back with this wee Fox in his arms. 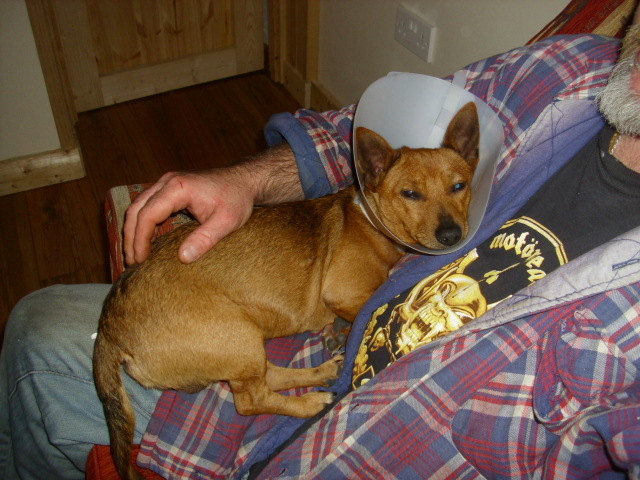 Just a baby….the dogs had attacked her in the forest and would have killed her had Andy not intervened. 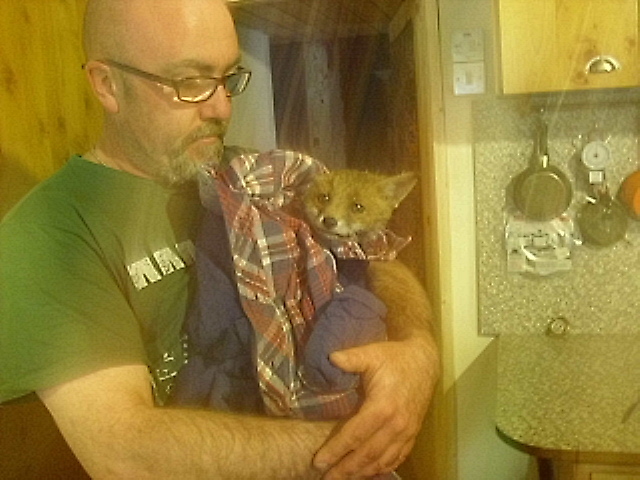 Once we got the dogs indoors Andy took the Fox baby to where he found her. Not a great pic but had to share it. 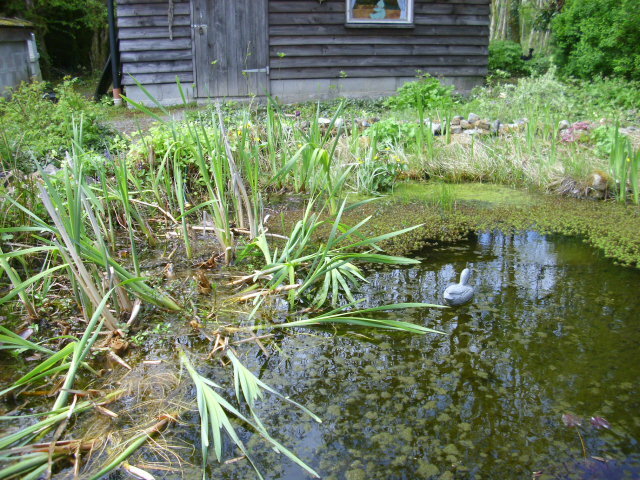 Garden work continues…a few days ago we gave the pond a good clean out. 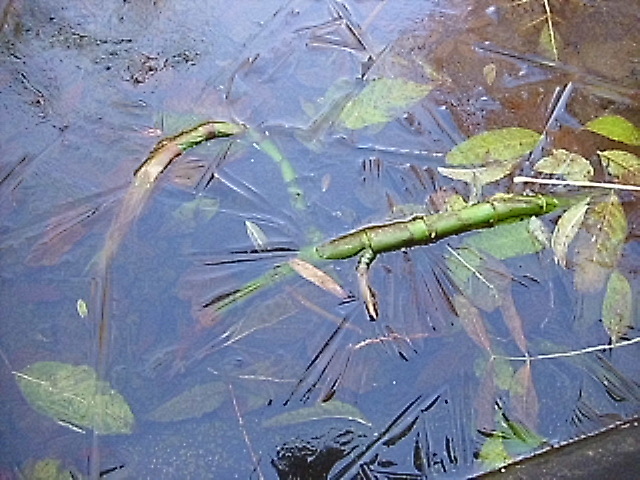 Everything was overgrown and the Bulrushes still had last year’s dead stems. Looking a lot better now. 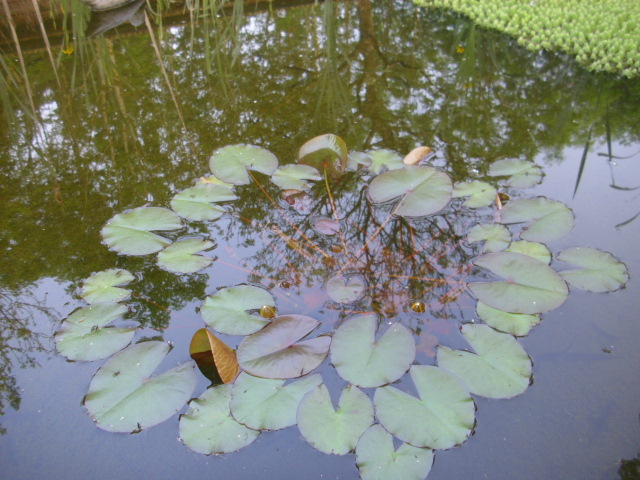 In the clean up we found 2 Water Lilies that were completely covered. 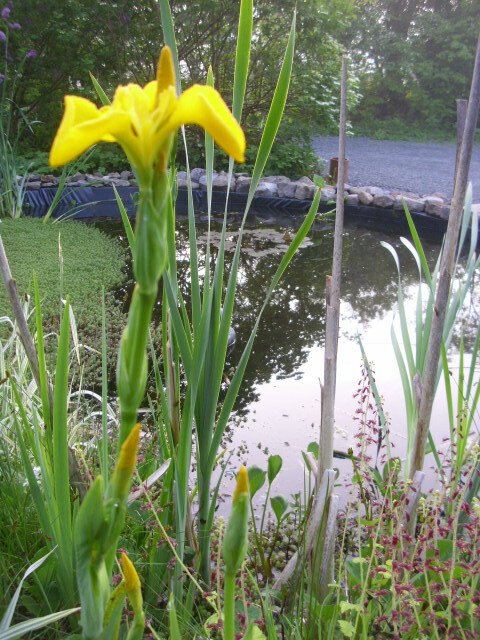 Hopefully they might flower this year. 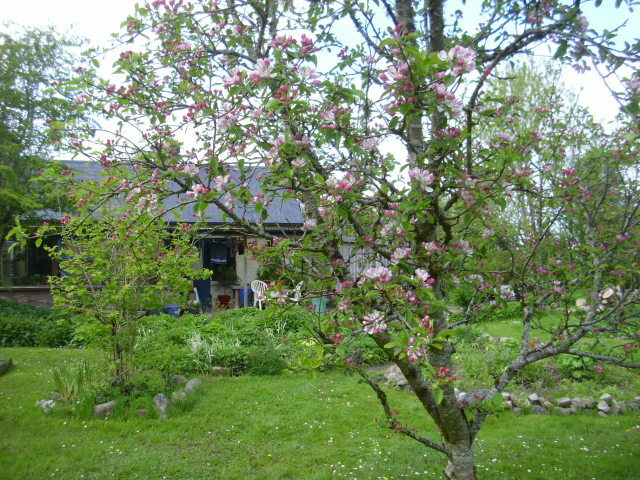 In the front garden the Apple trees are covered in blossoms. Lots of Bumble Bees about so they should be pollinated. 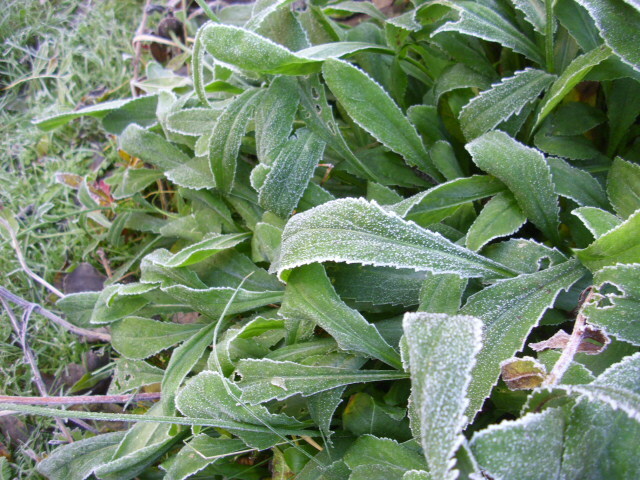 Everything has really come on the last couple of weeks even though the nights are still quite chilly. The farmers are complaining because the grass is not growing and all the fodder has been eaten. Hay is now being bought in from England and France. Even that is rationed. If there isn’t some real Summer weather soon the animal welfare problem will seriously escalate. Already many farmers are said to have lost animals due to malnutrition and hunger. 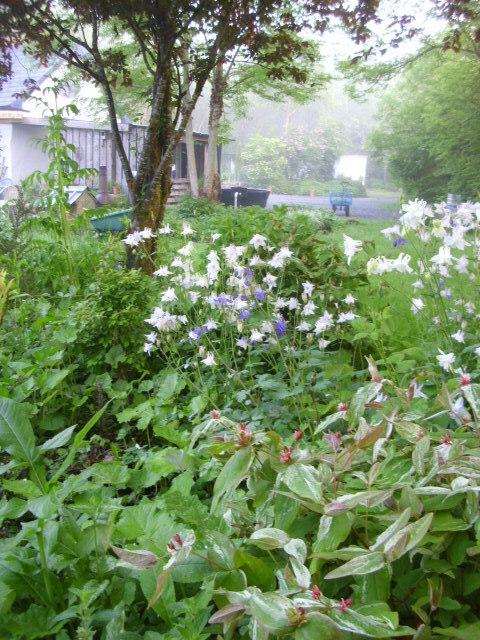 On the lane everything is looking very lush and green. But as usual the Ash still haven’t leaved out fully yet. They are always last. 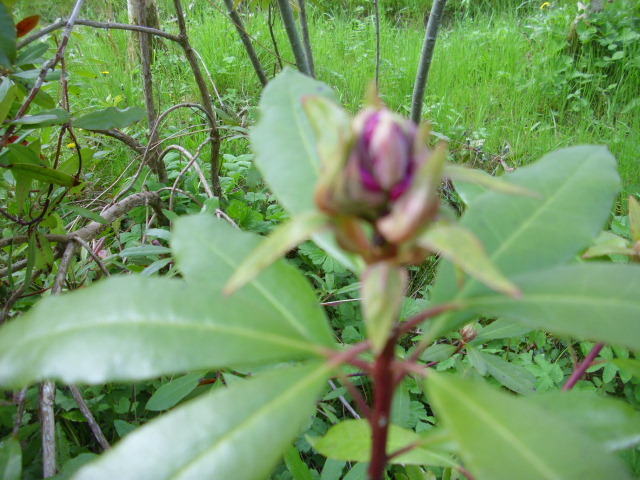 Rhododendron is also about to bloom. 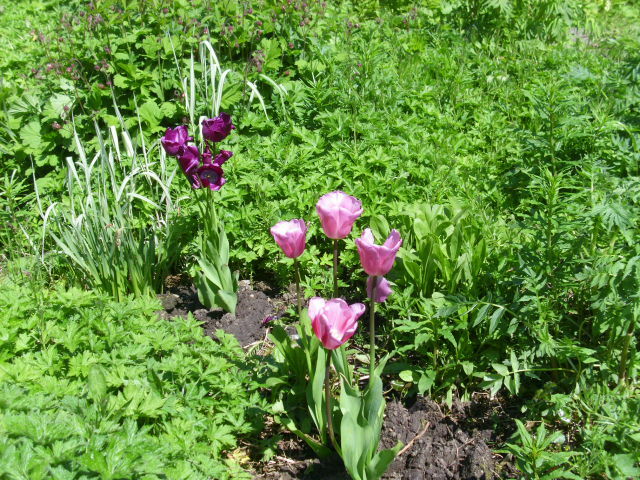 These are usually in bloom in the first week of May…so late this year…like so much else. 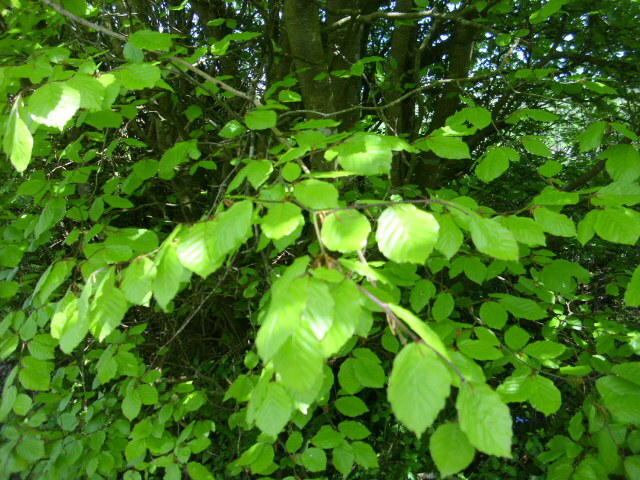 I just love the new leaves on the Beech. So fresh and soft when just unfurled. At this stage they can be eaten in a salad. Not particularly flavoursome but wouldn’t that beautiful green tempt anyone’s palate. 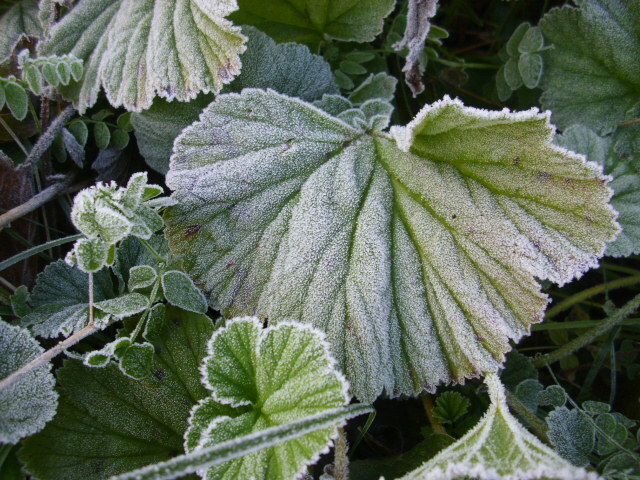 It is said that green is the colour of the heart chakra…these beautiful leaves really make my heart feel full of joy. 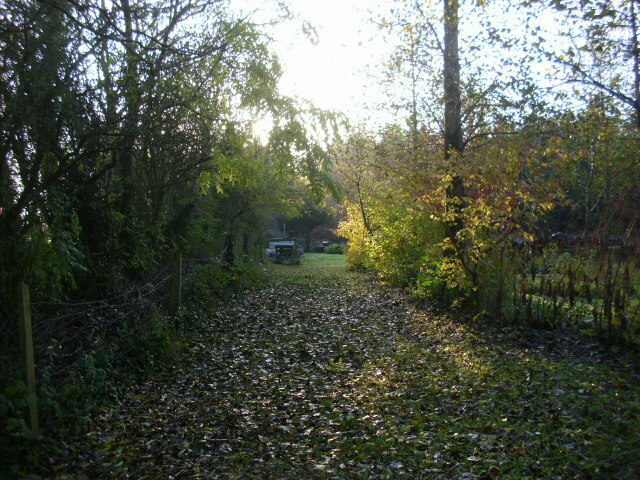 This area at the bottom of the garden was going to be a greenhouse built by the previous owners of our house. 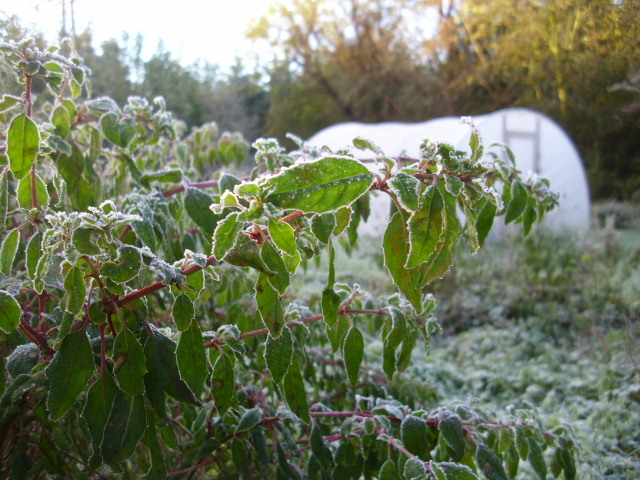 However the greenhouse never happened…it would cost a pretty penny to built a greenhouse this size. 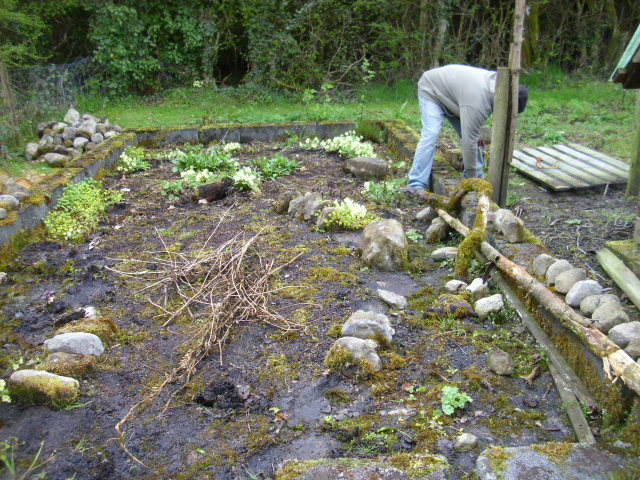 We decided to clear the area and make veg beds there. 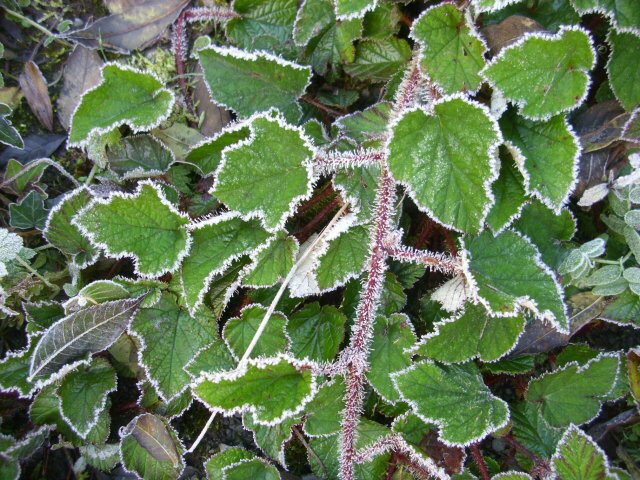 Hugelkultur is something I have been reading about for some time. 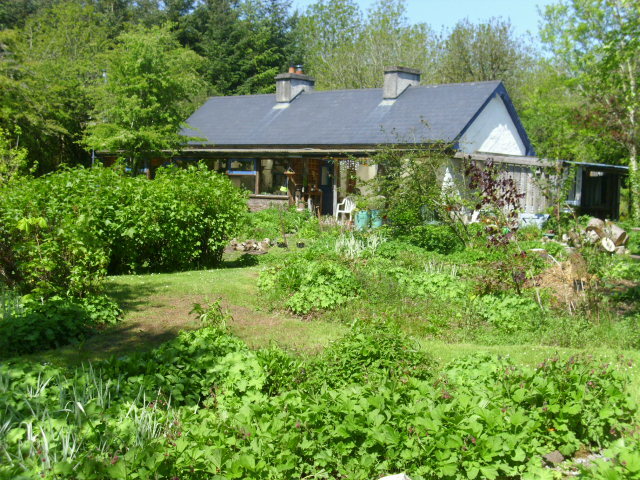 It is a permaculture technique where rotting wood is buried then covered with soil to make a rounded top bed. Lots of old wood lying about so we decided to give it a go. 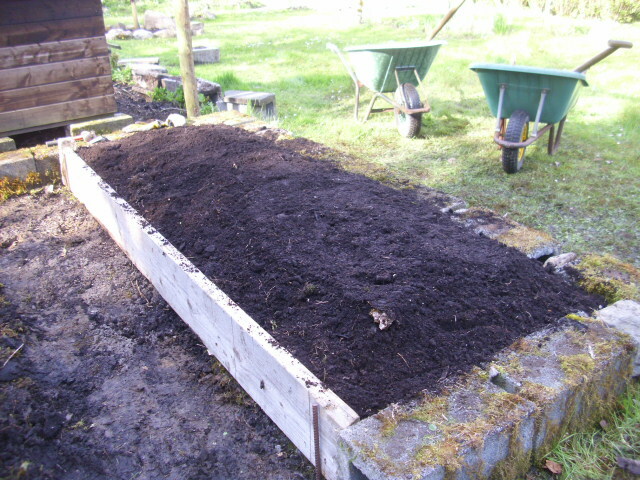 I have seen videos of people building the beds very wide and high too but as we intend making 4 beds in this area we kept them to 4 feet wide. 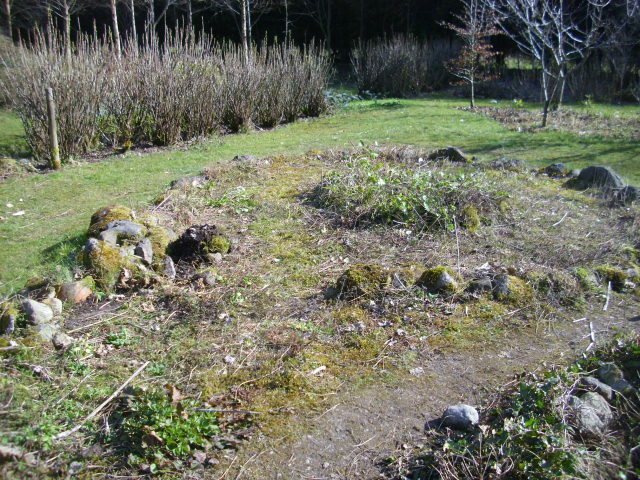 The outside edges of the foundation will serve as sides for the beds. 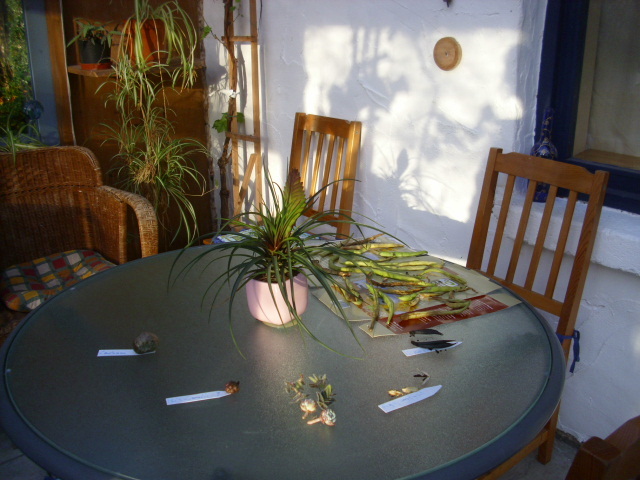 For the internal divisions we used old scaffolding sleepers which we bought for 3 euros each. 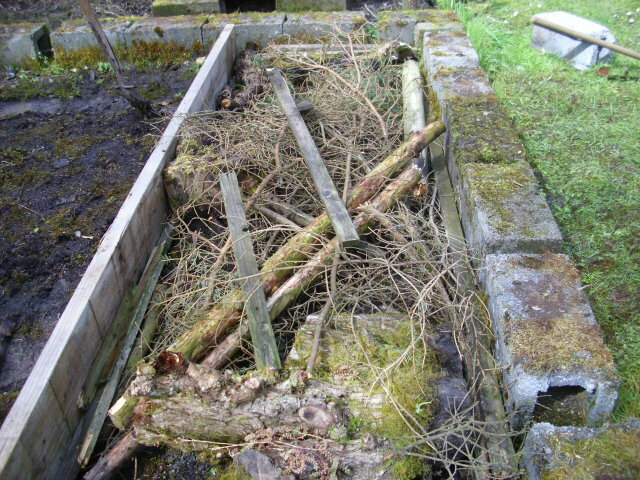 We then put any old wood lying about in the bottom of the bed. After reading up about the technique the consensus is that it’s better to use wood that has already started to rot as it doesn’t use up as much nitrogen to break down. 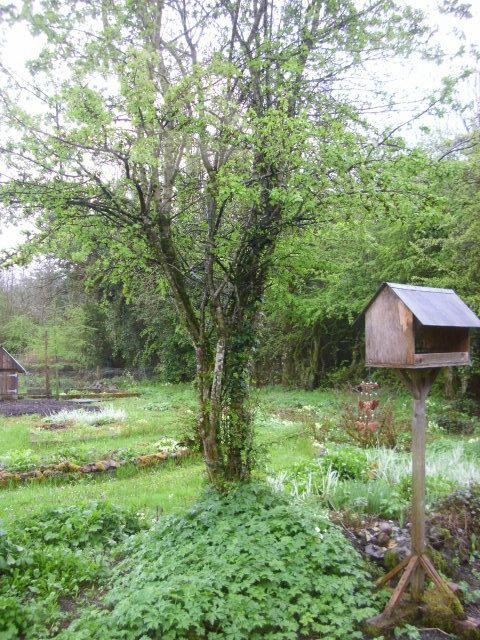 The rotting wood also emits some heat so that could extend the growing season a little. 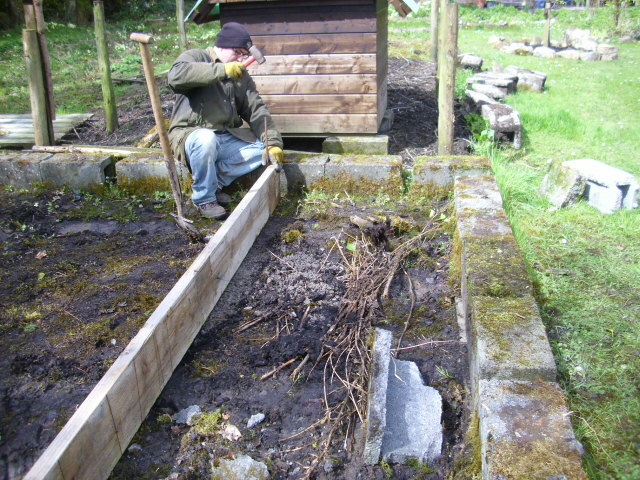 Compost is then piled on and worked down between any spaces. More compost on top and there you have it. 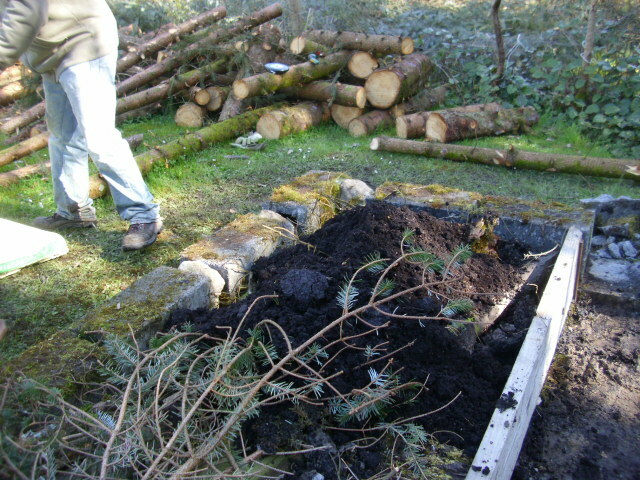 A nice bed ready for planting. There was really heavy rain after we’d made the bed so that helped it to settle. 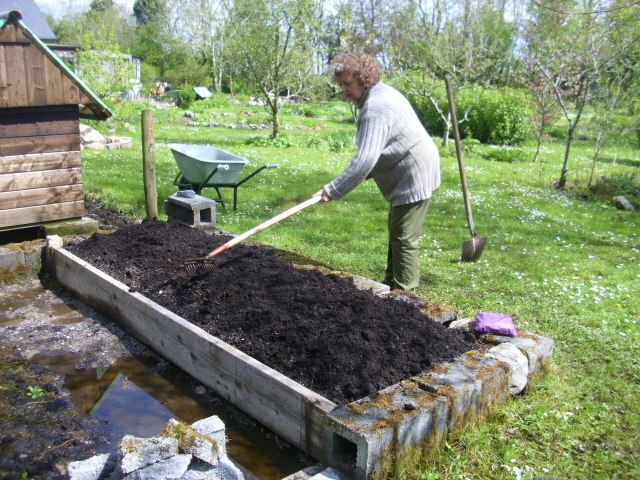 Before planting another barrow of compost was piled on top and raked in. 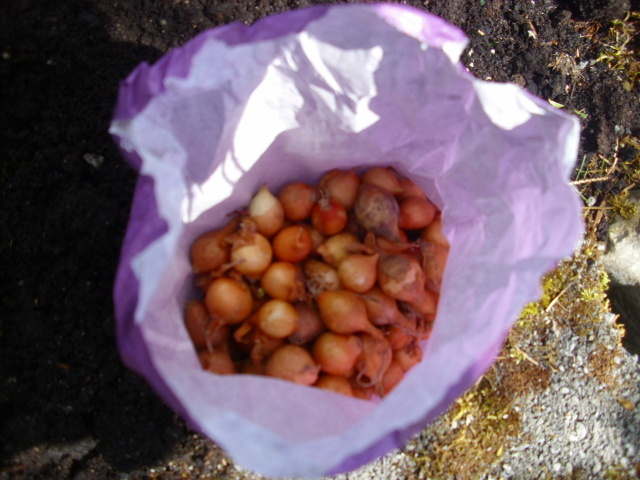 Onion sets were planted in our first hugelkultur bed. I like to plant them fairly close so that I can use every second one as spring onions or scallions as we Irish call them. Only 3 more beds to go and our first section of vegetable garden is done. It’s a wet day today. I woke up to the sound of rain this morning and on and off it’s been raining all day. Not your soft Irish rain but monsoon like downpours. 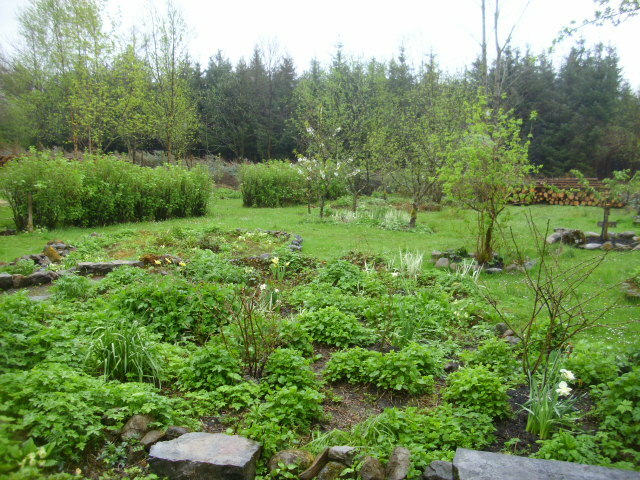 The garden is too wet to do anything out there. 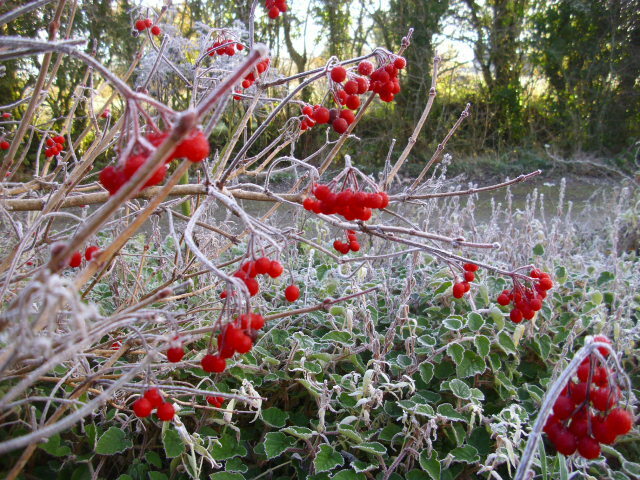 I took this pic through the conservatory window earlier. As you can see everything is very green again. The brown of Winter did seem to last a long time this year. 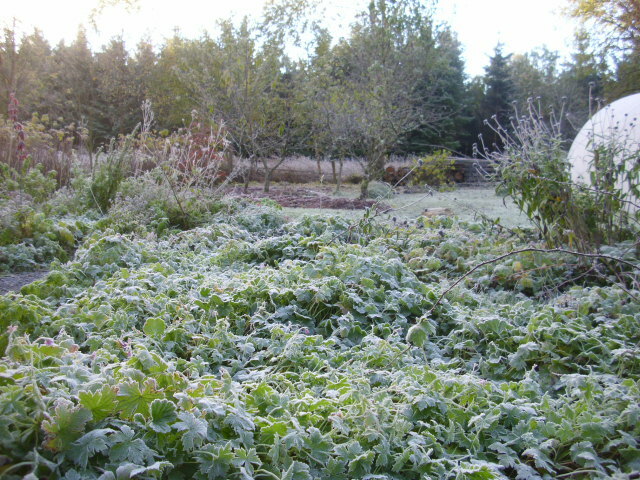 In this bed there is loads of Lemon Balm, Geum of which I don’t know the colour yet. Looks like it will bloom soon though. Daffodils which are just finished now and a few Roses I transplanted here earlier in the Spring. 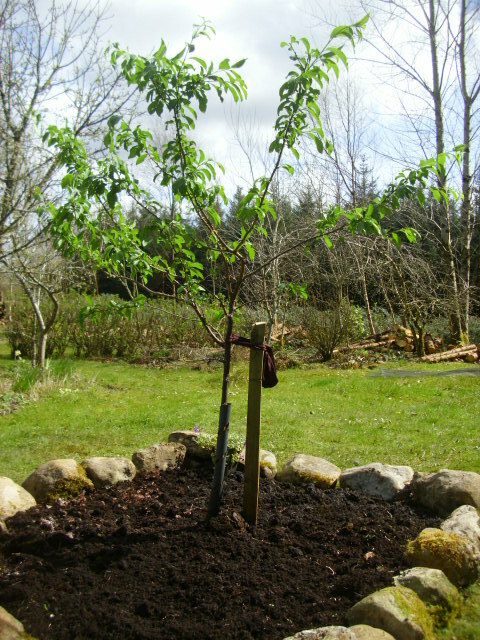 Last week we planted our first tree here. 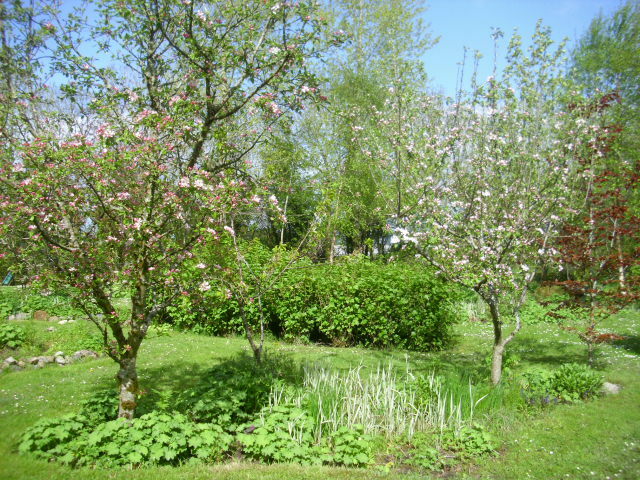 A Victoria Plum… plums do well here in the North West…they seem to like the heavy soil. Andy hammered a good stout stake when the tree was in. 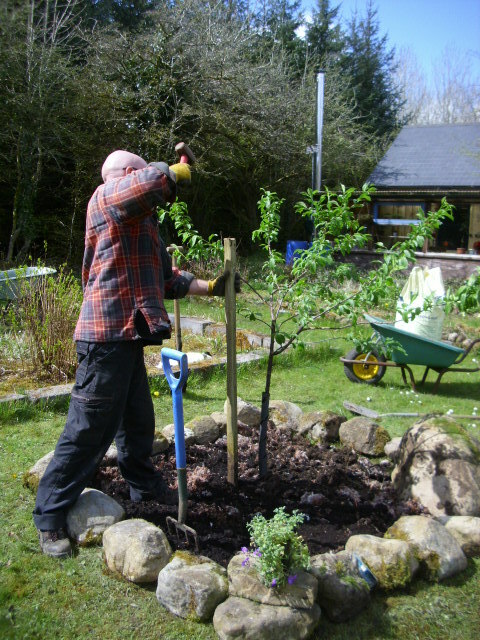 It’s always a good idea to stake trees as they establish better when they’re not rocked by wind. When Andy sat down for a break Freddie decided to give him an all over head massage…with his tongue. 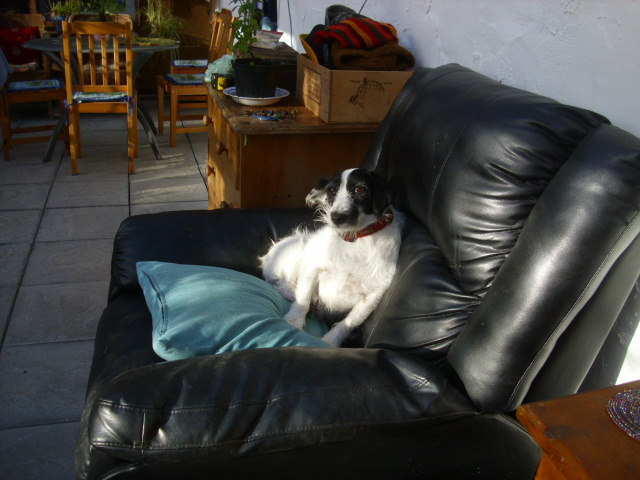 Better put up a picture of Lettie in case she gets jealous. Don’t think she’s too unhappy with the wet day! 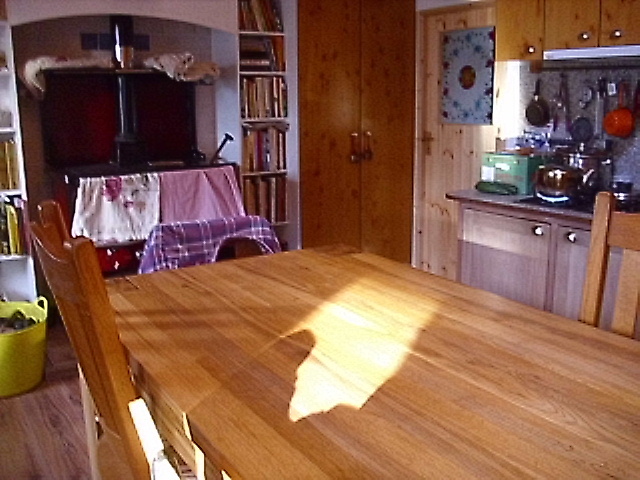 Crazy to be lighting the stove during the day at this time of year but that’s how it is so far this year. 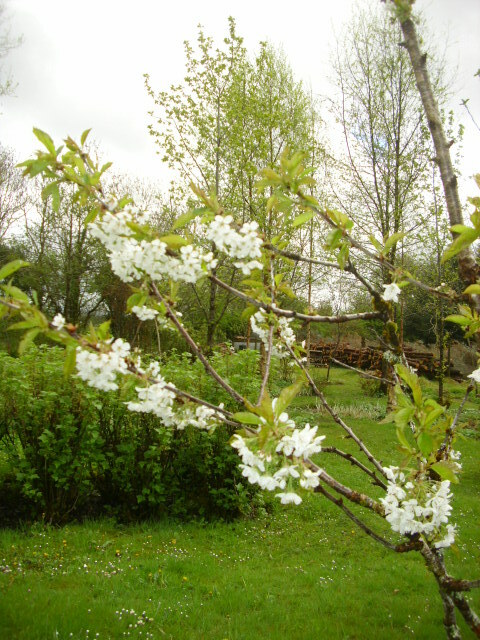 Elsewhere in the garden the Cherry tree has loads of blossoms. I’d be made up if we got ripe Cherries. Apparently the birds go mad for them. 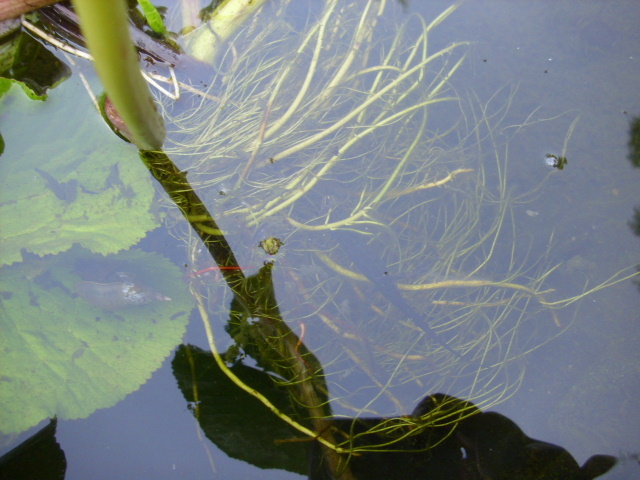 This is a small tree so it could be netted. 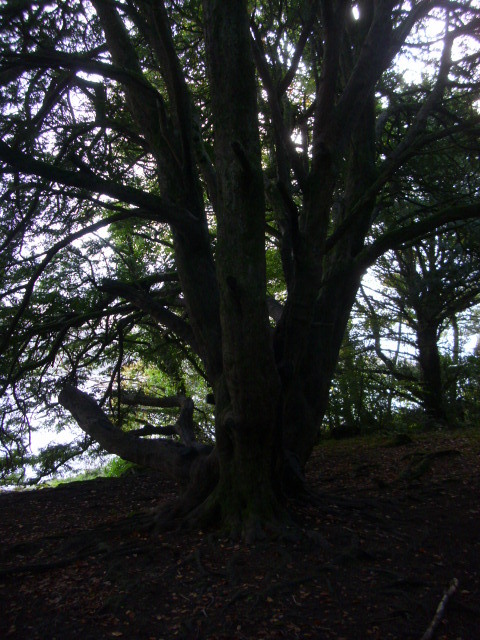 The Hawthorn is also in leaf now…I love how the perennial Geranium has grown up closely around the trunk of it. 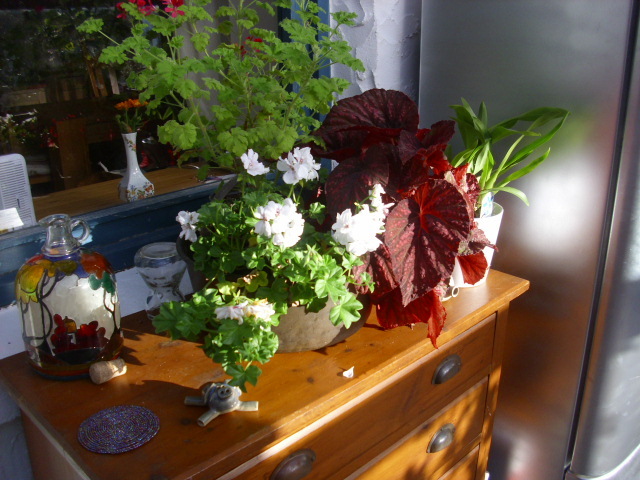 Don’t know what colour flower this Geranium has…it was already planted here. Surprise gardening is the theme this year as a lot of stuff was already planted when we arrived…just wait and see what comes. 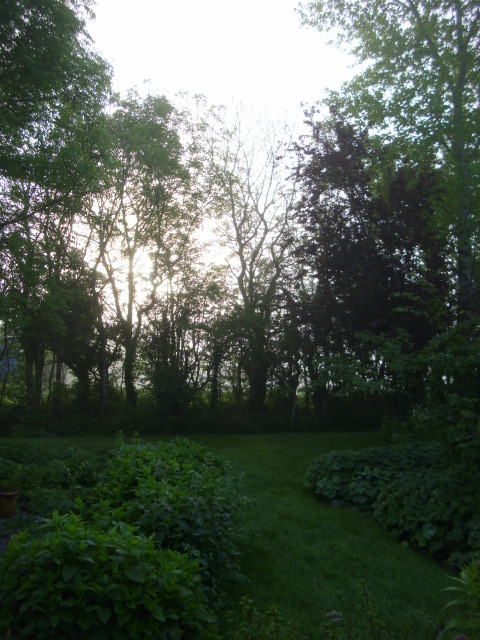 As I write the rain has stopped…and the sun is shining. Hurray! 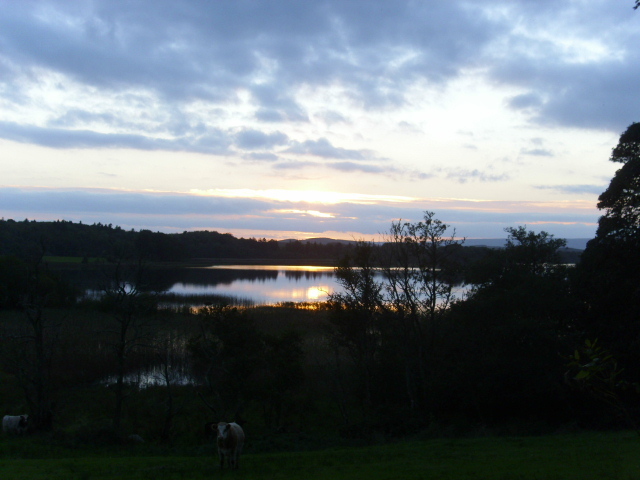 At least we have the longer evenings now so all is not lost. Bye for now! I’m off to catch a few rays. A Walk and picnic in Union Woods. 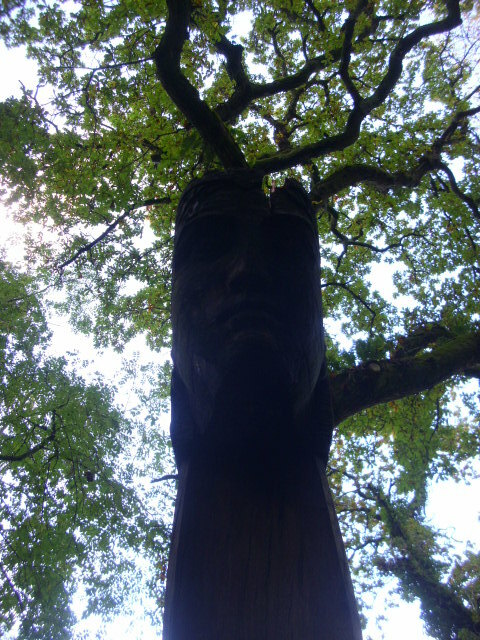 Yesterday, as we often do, we went for a walk in a woodland. 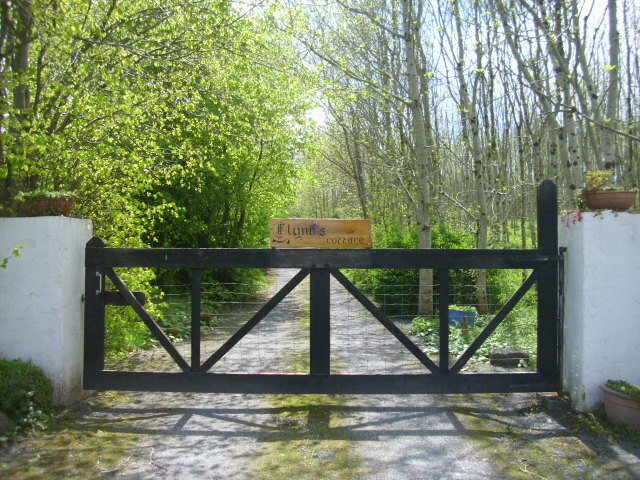 Yesterday’s destination was Union Wood in nearby County Sligo. There was only 4 of us this time but there were lots of people in the woods, which was lovely to see. Walkers, joggers, cyclists and dog walkers were all out in good numbers. 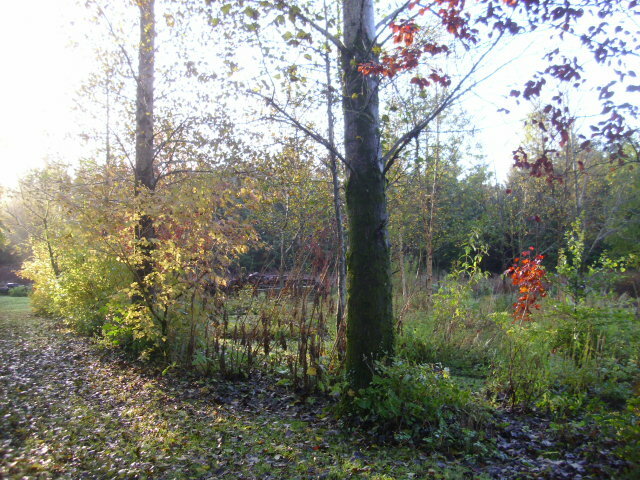 It gave a nice lively feel to the forest. Not that a forest would ever feel dead but the people about gave an extra energy. 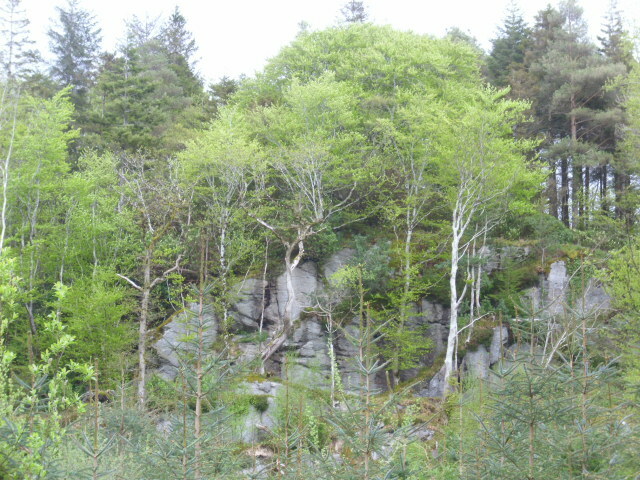 actually some of the trees look like they are growing out of the rock cliffs. 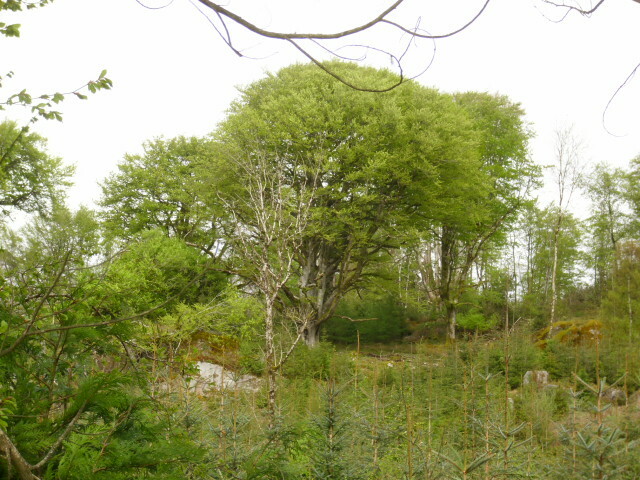 This part of the forest is made up mainly of Ash, Beech, Hazel and Oaks. Its amazing to see so many Oaks in one forest. 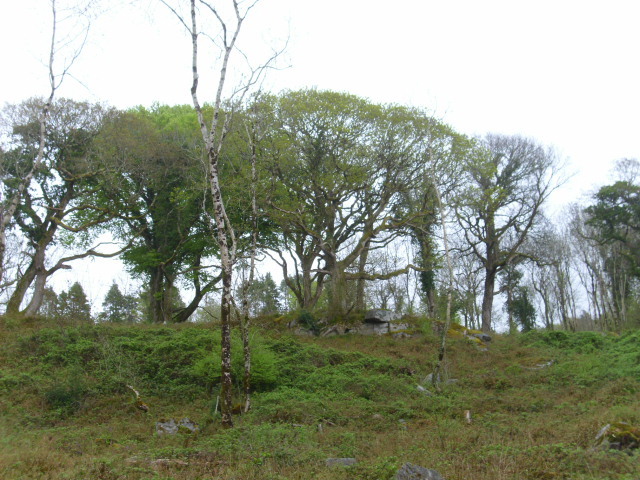 A local man who stopped for a chat said he had counted the trees and his Oak count was roughly 4,5oo trees. Fab! 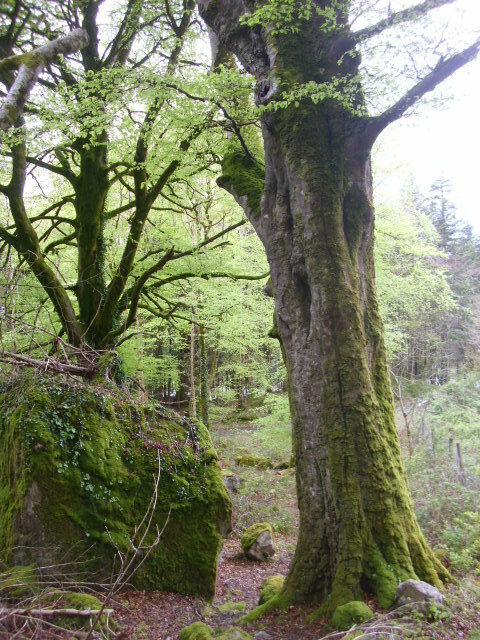 To think that Ireland was once covered by forests like this. Our pace is nice and slow. 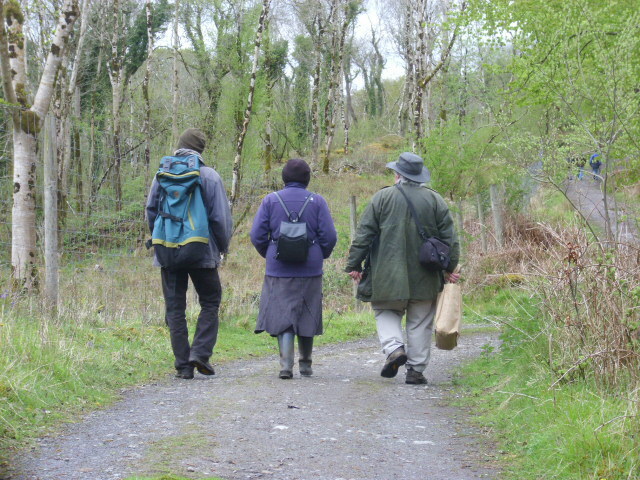 Time to chat as we walk…and all the while absorbing the relaxing, healing vibration of nature. 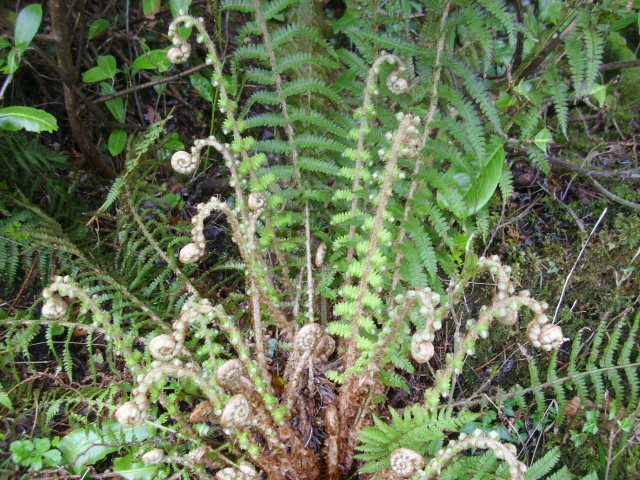 Aren’t these unfurling Ferns just beautiful? 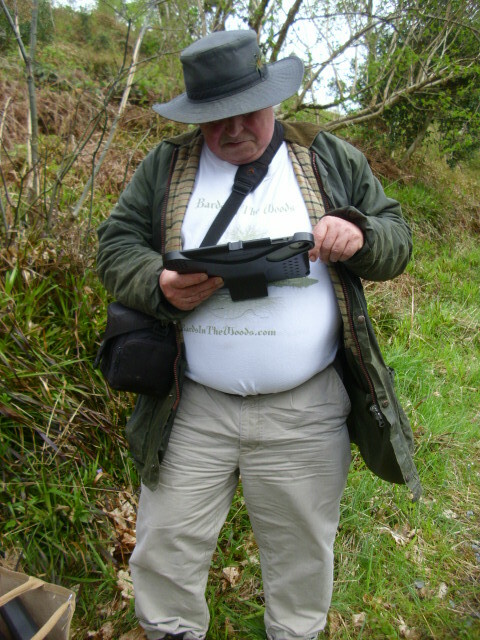 John on his iPad trying to identify an unknown tree. Turns out it was a Wild Cherry. 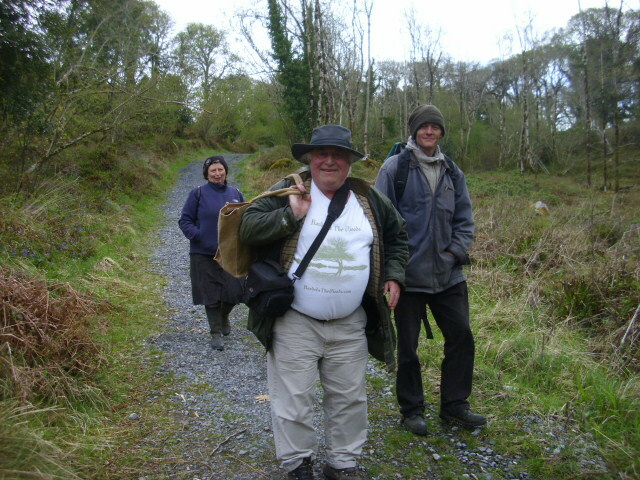 Check out John’s Bards in the Woods t-shirt. 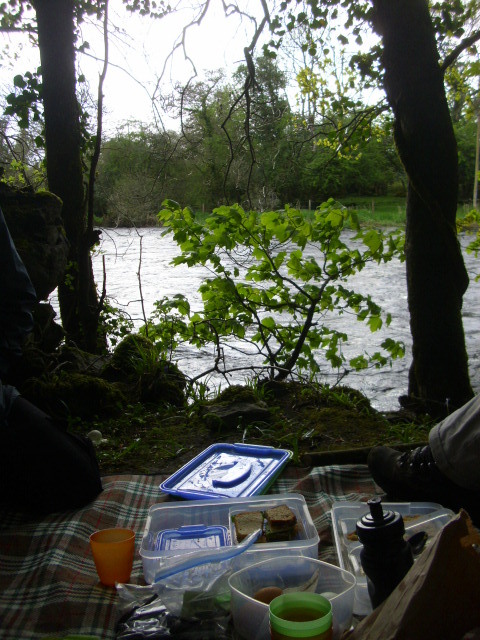 a picnic beside the river…and reluctantly we leave the forest… and head for home. 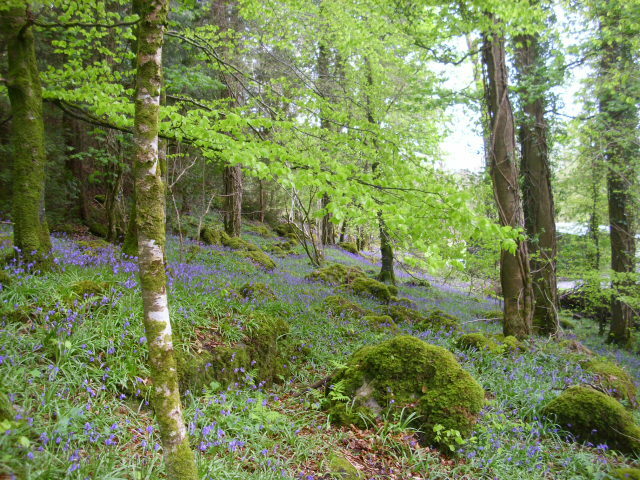 If you want to join our woodland walks or indeed seek inspiration to start woodland walks where you live check out Woodland Walks, Bards & Picnics Around Ireland on Facebook or www.bardsinthewoods.com . 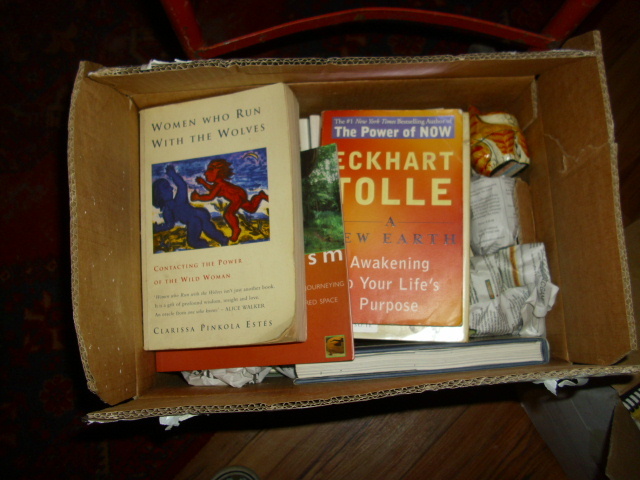 Climate change, unpacking boxes and favourite books. 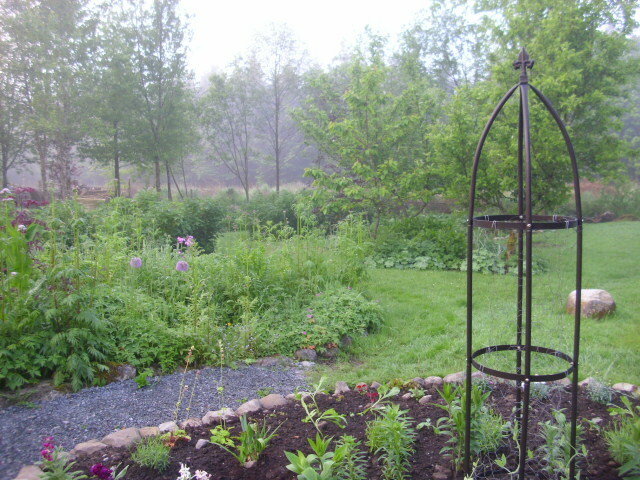 The weather is back to rain again so garden days are at a standstill for a little while. Really heavy rain last night…monsoon like…lots of flooding today. Apart from more rain in the last few years I also notice that the rain has changed…much heavier monsoon like sheeting rain. I suppose that’s climate change. There’s no denying it’s existence even here in Ireland. 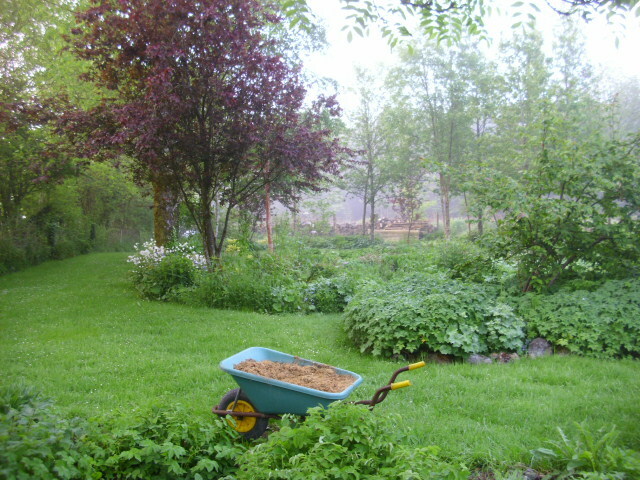 Anyway the rainy days give us a chance to work indoors on the cottage renovations. 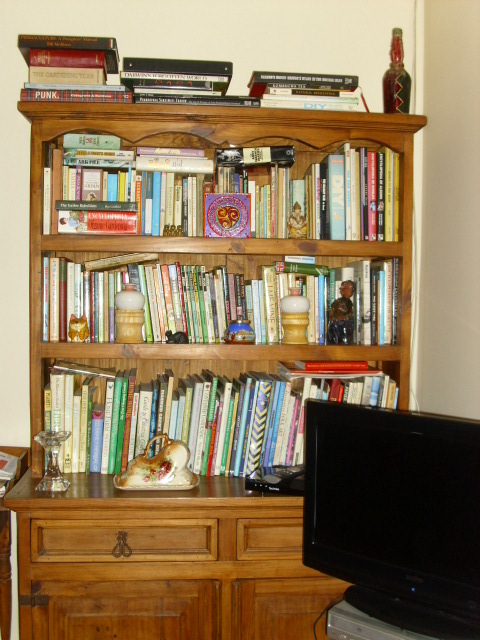 The sitting room is finished now so with great joy we start unpacking things not seen since last September. The thing I missed the most in that time was books. I know everything can be looked up on Google now but for me nothing beats picking up a book. 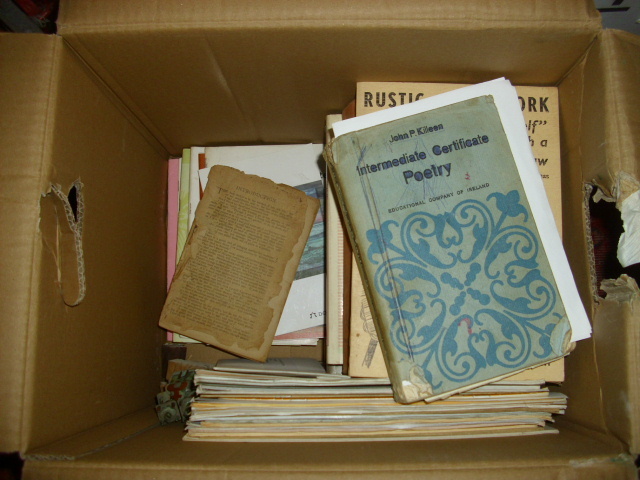 As each box is opened one is reacquinted with old friends. 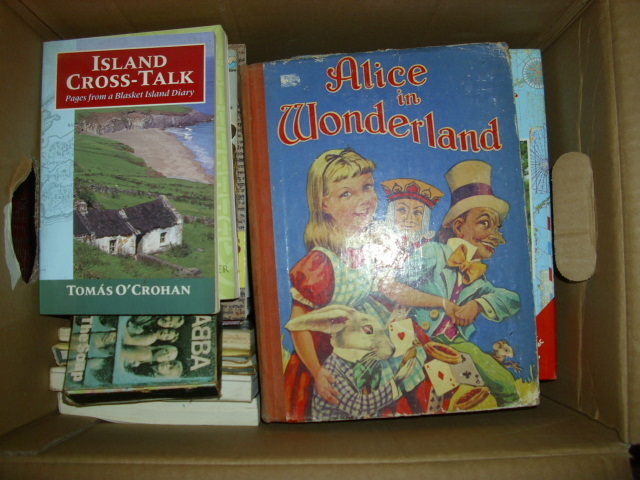 Alice in Wonderland my favourite book from childhood…. an old herbal book given to me by a lady long left this world and from my school days a poetry book. Time to stop and read once more my favourite poem…ever. 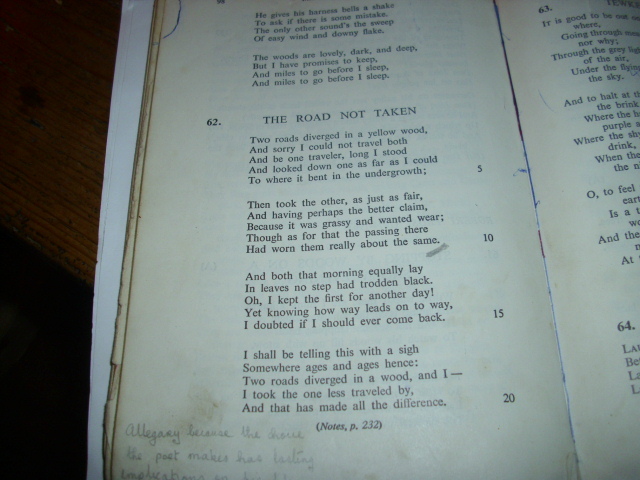 The Road Not Taken by the American poet Robert Frost. 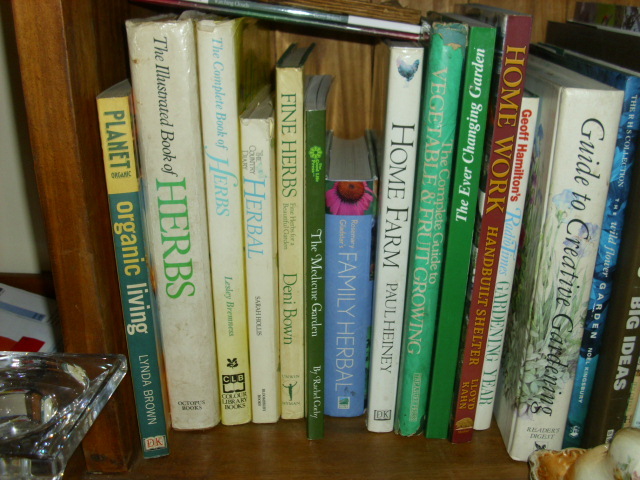 Herbal reference books and of course gardening books…all at my fintertips once again. 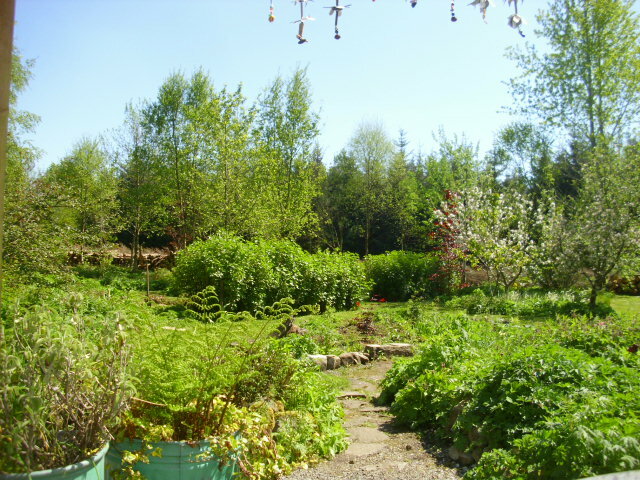 These will be much used over the Summer as the garden work continues and herbal potions are made from hedgerow plants along the lane. as is the trinity knot. 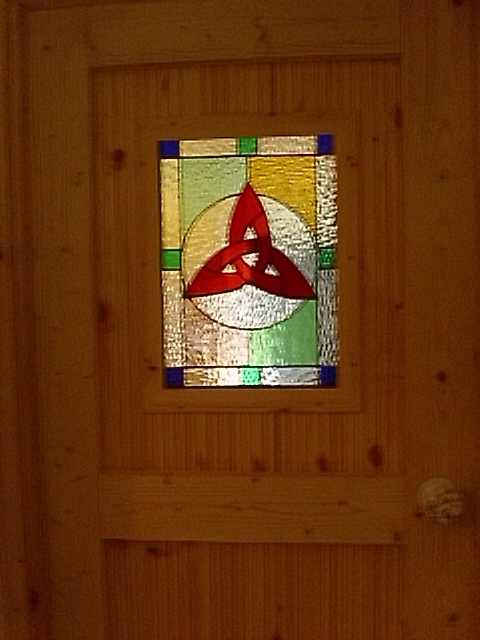 This is on a piece of stained glass set into the sitting room door. The door was made by our friend Alan and the glass was made by a guy called Matt Black who used to have a shop in Drumshanbo. I really love to have things made by local people. I picked up the porcelian handle in a charity shop for 2 euros. You can’t see it very well in this pic but it has an exotic bird on it. Yippee! 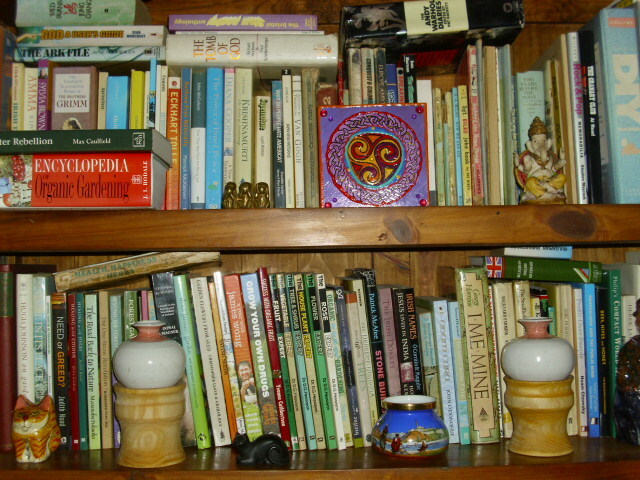 The books are back…onto the next room…or…if the weather picks up again…some more garden work. I wonder what tomorrow will bring?